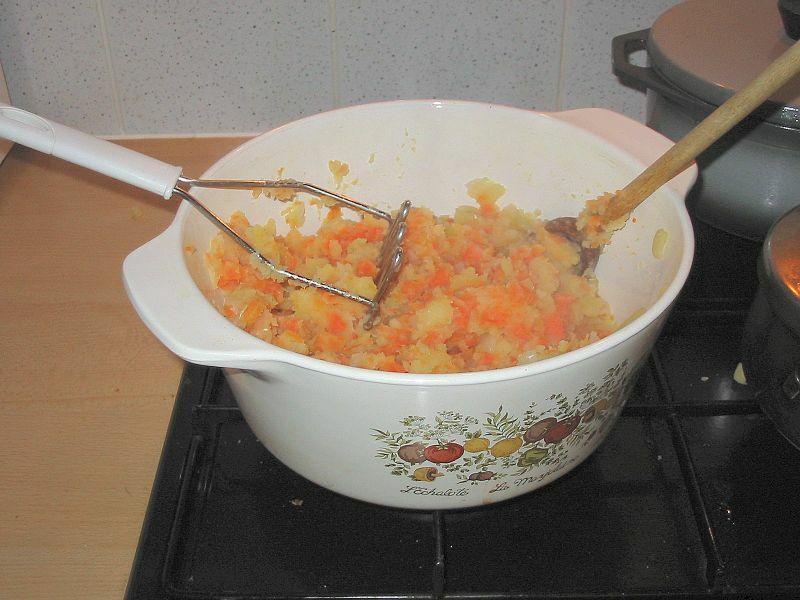 Hotchpotch (or in Dutch: Hutspot) is a dish of boiled and mashed potatoes, carrots and onions with a long history in traditional Dutch cuisine. According to legend, the recipe came from the cooked bits of potato left behind by hastily departing Spanish soldiers during their siege of Leiden in 1574 during the Eighty Year's War, when the liberators breached the dikes of the lower lying polders surrounding the city. This flooded all the fields around the city with around a foot of water. As there were few, if any, high points (and September in the Netherlands is not exactly a warm month), the Spanish soldiers camping in the fields were essentially flushed out. The anniversary of this event, known as Leidens Ontzet, is still celebrated every October 3 in Leiden and by Dutch expatriates the world over. 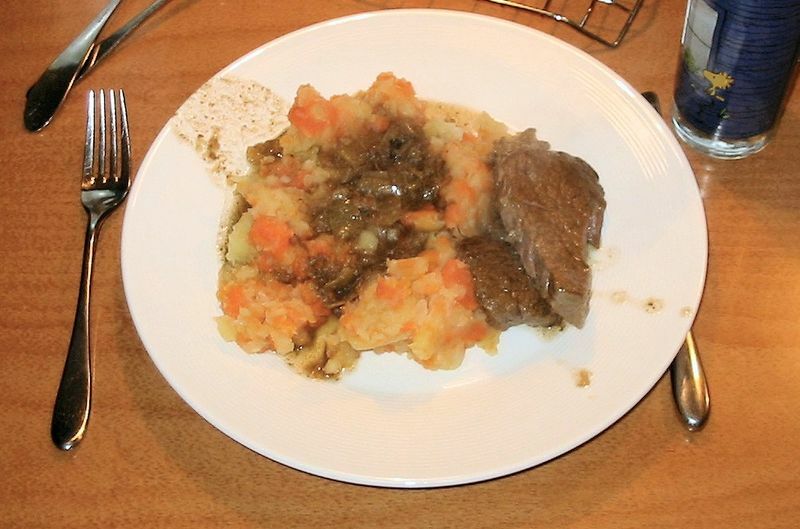 Traditionally, the celebration includes consumption of a lot of "Hutspot met klapstuk/stooflap" (Hotchpotch with chuck roast/beef shoulder chops). Left: Hutspot with stooflap (meat) on plate. The first European record of the potato is as late as 1537, by the Spanish conquistador Castellanos, and it spread quite slowly throughout Europe from thereon. So the original legend probably should refer to what the Dutch call a 'sweet potato' or pastinaak which is a parsnip; this vegetable played a similar role in Dutch cuisine prior to the use of the potato as a staple food. During the Nazi occupation the dish came to represent freedom from oppression since its ingredients could be grown beneath the soil and thus somewhat hidden from sight, and the carrots gave the dish an orange colour, which represents the Dutch Royal Family. Hutspot is very popular during the long Dutch winter. Related Dutch mashed potato dishes such as stamppot include "farmers' cabbage" or kale, endive, brussels sprouts and/or sauerkraut, generally with some rookworst (smoked sausage) or smoked bacon. The chunky texture of the dish distinguishes it from other more smoothly pureed potato-based dishes.